Lightly shape ground beef into four 3/4" thick patties. Brush onion with oil. Place patties in center of grid over medium, ash-covered coals. Place onion around patties. Grill, uncovered, 13 to 15 minutes to medium (160°F) doneness, until patties are not pink in center and juices show no pink color and onions are tender, turning occasionally. Season with salt and pepper. About 1 minute before patties are done, top each with 2 cheese slices. Mix mayonnaise and mustard; spread on roll tops. 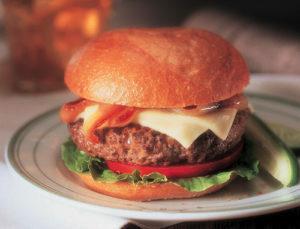 Serve burgers and onion in rolls with lettuce and tomato.